Manufactured in Etats-Unis from 1933 until 0. This model has some common features with the Boy Scout Brownie, including the enlargement of the collar around the lens at the bottom part of the lens. It is also found on the Brownie Junior Six-20. Since both devices are from 1933 -34, we can deduce that it is from the same period of time. The identification is only possible in the presence of the handle, as the model name is written there. 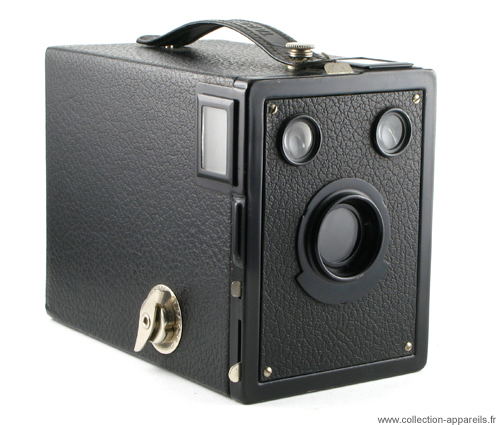 To open this camera, you must first pull the film advance key, then press the button in front of the handle on top of the unit. Then positioning the fingers on the two small reinforcements situated on the vertical edges on front, pull the front. The camera body is separated into two parts. With the front face comes the inner part of the camera.